Conryu has his life all figured out. At least until the final day of school arrives and with it the annual wizard’s test. When Conryu passes the test, no one can believe it since everyone knows boys can’t do magic. Suddenly thrust into a world of magic and danger, Conryu must figure out how to use his news powers and quickly. 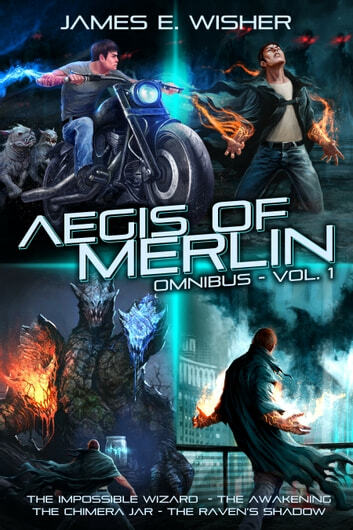 He soon finds himself n the run from a mad religious cult and hunted by a group of wizards that view a man wielding magic as the worst abomination imaginable. When his home city is taken hostage by the sinister Lady Raven, Conryu is the only one that can save the day. Can Conryu master his magic before it’s too late? 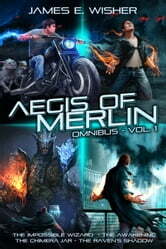 This Volume contains the first four novels of the Aegis of Merlin Urban Fantasy Series: The Impossible Wizard, The Awakening, The Chimera Jar, and The Raven’s Shadow.